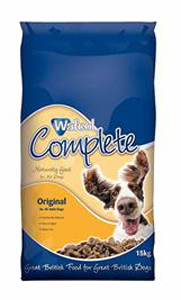 As part of their pet care products they own the Wafcol range of pet foods. 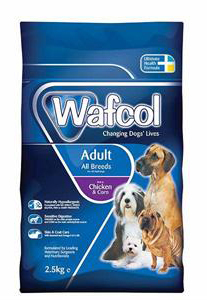 Wafcol in some ways is a confusing brand, containing both basic and higher quality recipes within the range, which covers all the necesary life stages. Ingredients vary considerably. The 'Original' recipe is based upon wheat flour and bran together with poultry meat meal, whereas their 'Sensitive' range is much more of a 'natural' recipe, though containing soya which some owners would prefer to avoid. Expect to pay £37 for a 15kg sack of the original, which is very expensive for a basic recipe, and the same for 12kg of Sensitive, which is more expensive than some equivalent and soya-free recipes. Maize (59%), Poultry Meal (21%), Soya, Soya Hulls, Seaweed (3.4%), Sunflower Oil, Poultry Digest, Minerals, Mannoligosaccharides (MOS 0.14%), Vitamins, Brewers Yeast. Additives: Nutritional Additives; Vitamins (kg): Vitamin A (as retinyl acetate) 23,148 iu, Vitamin D3 (as cholecalciferol) 1,852 iu, Vitamin E (as alpha tocopherol acetate) 69 mg. Trace Elements (kg): Zinc Chelate of Amino Acids Hydrate 308.64 mg, Zinc Sulphate Monohydrate 128.60 mg, Ferrous Sulphate Monohydrate 92.59 mg, Cupric Chelate of Amino Acids Hydrate 32.41 mg, Manganous Sulphate Monohydrate 30.86 mg, Cupric Sulphate Pentahydrate 12.96 mg, Calcium Iodate Anhydrous 3.03 mg, Sodium Selenite 0.21 mg. Whole wheat flour, poultry meat meal, wheat bran, soya, rapeseed oil, yeast, vitamins and minerals. .